Figure 4.36. Ejector ram-scramjet powered HTOL SSTO with a gross weight of 300 tons, a weight ratio of 4.3 and an oxidizer/fuel ratio of 2.2.
erates through the transonic flight regime. It is depicted climbing from an air launch from a C5A, but it could just as easily have separated from an An225. If this were a TSTO vehicle, a smaller version of the vehicle in Figure 4.35 would be on top, and separation would be in the Mach 8 to 14 region. As one of the reference operational vehicles for the 1970 HyFAC study, this airbreathing launcher was the first stage of the TSTO vehicle that staged at Mach 10 to 12. 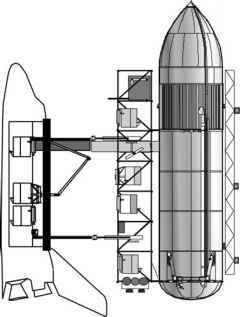 Later, as the CFD (Computational Fluid Dynamics) verification model for Copper Canyon and the subsequent NASP program, it was an SSTO configuration. Again the design goals were for frequent flight spanning a long operational life with significant flights between overhaul, as for the Model 176. Unfortunately no actual goal numbers survive. Figure 4.37. Two elegant TSTO designs. The MBB Sänger (top) and Dassault Aviation Star-H (bottom). is volume for both the passengers and methane, replacing the hydrogen and oxygen for the launcher. Dassault Aviation Star-H used a different approach for the second stage. Since the thermally protected second stage glider is the most costly, the Dassualt Aviation Star-H approach is to minimize its size and carry payload only, and provide for the propellant and thrust in a separate expendable rocket. This reduces the size of the hypersonic glider, in this case depicted as the Hermes. This was also the philosophy of Glebe Lozino-Lozinski in the Mig 50-50 concept that dated back to 1968. Both the MBB Sanger and the Dassault Aviation Star-H are elegant designs that would have been successful had they been built. However, both suffered from a propulsion community mistaken assumption: that the turbojet was the best accelerator for lower-speed operation (Mach 2.5 to 3.0). The resultant massive over-under turbojet/ramjet propulsion system of the MBB Sanger and the turboramjet propulsion of the Dassault Aviation Star-H appear to be their downfall. 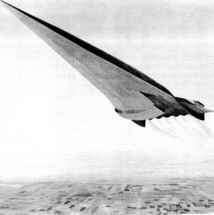 A rocket ejector ramjet or airbreathing rocket would have provided excellent acceleration capability. In [Czysz and Vandenkerckhove, 2000] a TSTO with a rocket ejector ramjet is compared with a TSTO powered by a turboramjet. Both TSTO launchers were sized to deliver a 7-ton payload to 463 km in a 28.5-degree inclination orbit. The staging Mach number was 7 (same as the MBB Sanger). The turboramjet launcher consisted of a second stage weighing 108.9 tons, carried by a 282.7-ton first stage for a total liftoff weight of 393.0 tons. The rocket ejector ramjet launcher consisted of a second stage weighing 118.4tons, carried by a 141.6-ton first stage for a total liftoff weight of 261.0 tons. The reason for the difference is the ejector ramjet thrust is nearly constant from transonic to staging speeds, while the turboramjet at staging speed is only 25% of the transonic thrust. The turboramjet will have significantly more thrust at takeoff but that is not as important as maintaining a constant supersonic acceleration. The result is the turboramjet launcher suffers a 50% gross weight penalty at takeoff compared with the ejector ramjet. If a commercial hypersonic transport version of the first stage was contemplated, then the propulsion system would have to be changed to a cruise-focused system, replacing the acceleration-focused system of the launcher. The acceleration-focused system must maximize thrust minus drag and minimize zero lift drag. The cruise-focused system must maximize aerodynamic efficiency (lift-to-drag ratio) and propulsion efficiency (energy conversion efficiency). This change in focus almost precludes a single system from doing both missions. The exception might be Rudakov's combined cycle with the performance shown in Figure 4.16. The attempt to get one gas turbine based propulsion system to do both is the weakness of most of these TSTO programs. Yet TSTO launchers are an excellent option, and with a suitably powered TSTO a substantial saving in gross weight can be realized together with significant payload flexibility. 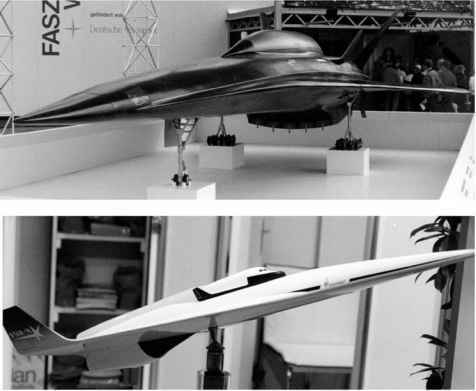 P. Czysz and the late Jean Vandenkerckhove extensively examined in the 1990s the SSTO compared to the TSTO based on rocket ejector ram-scramjet propulsion. That work later became part of an AIAA Progress in Aeronautics and Astronautics book [Czysz and Vandenkerckhove, 2000; Vandenkerckhove, 1991, 1992a,b, 1993]. Figure 4.38 compares the takeoff gross weight (TOGW) results, and Figure 4.39 compares the dry weight (OEW) results. Nine comparisons are made as given below. Note that any crew for space operations or crew rotation on an orbital station are considered payload, not crew, that is, pilots. (1) SSTO with VDK CURRENT structural concept (reference 21.0 kg/m2) with 15% dry margin and crewed (piloted) by two crew members with provisions for orbital stay, powered by ejector ram-scramjet of VDK design, HYPERJET Mk #3 [Vandenkerckhove, 1993a]. (2) SSTO with VDK CURRENT structural concept (reference 21.0 kg/m2) with 15% dry margin and piloted by automatic flight control system, powered by ejector ram-scramjet of VDK design, HYPERJET Mk # 3 [Vandenkerckhove, 1993a]. (3) SSTO with VDK FUTURE structural concept (advanced 18.0 kg/m2) with 15% dry margin and crewed (piloted) by two crew members with provisions for orbital stay, powered by ejector ram-scramjet of VDK design, HYPERJET Mk #3 [Vandenkerckhove, 1993a].